Doggy In Wonderland has a wonderful collection of dog leads and leashes for you to choose from. There\'s probably nothing your dog enjoys more than one on one time spent with you walking him with a dog lead. Whether you prefer a practical dog lead or something a little more stylish, we have the perfect dog lead leash for you and your pup. 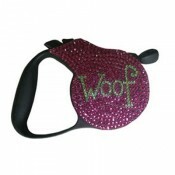 Our fashion leashes are for those pet owners who prefer a little bling. With selections that feature jeweled and beaded leashes or retractable leashes encrusted with Swarovski crystals, you are sure to find the perfect fashion leash for your dog. If you lean a little more towards the practical, it still doesn\'t mean you have to be dull and boring when it comes to retractable leashes. Our retractable leash collection which is within our fashion leash collection features dog leads in many different patterns and colors but they all retract allowing your pup to explore on his dog lead just a little further. 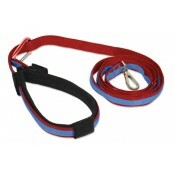 Retractable leashes are wonderful for allowing a little freedom but maintaining safety at the same time. Doggy In Wonderland offers traditional dog leads in a myriad of colors, patterns, widths and lengths, allowing you the perfect option for you dog. Shop our dog leashes today and get walking, but don\'t forget to pick out a matching or coordinating pet collar while you\'re at it!